Light Elegance Gel Nail Products introduces a new Pro Kit for nail technicians wanting to jump into gel nail products as an enhancement system for their clients. Light Elegance Gel Nail Products introduces a new Pro Kit for nail technicians wanting to jump into gel nail products as an enhancement system for their clients. Light Elegance can be used on any tip or used with forms to sculpt a natural or French extension. Cleanse the fingernail with a Light Elegance cleansing wipe and Light Elegance Cleanser. Push back the cuticle and remove any eponychium before removing the shine with a l00-grit Perfect File. Select and adhere the tip to the nail. Glue the tip into place, and trim it to the desired length. Apply a sparing amount of Bonder to the surface of the nail and tip. Then, cure the Bonder in the Easy Cure Lamp. Apply a thin coat of Extreme Gel to the surface of the nail. 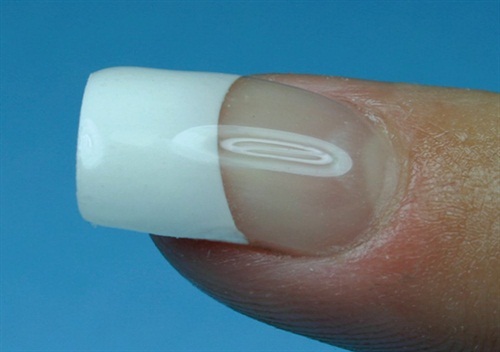 It should be applied so that there is enough gel to cover the nail and add an arch and curve to the nail. Apply a thin layer of gel to the tip of the nail and cure. Cleanse the nail to remove the sticky layer and file the nail with a 180-grit Perfect File to perfect the arch and curve. Using a 180/280-grit Foamie, smooth the nail to reduce file marks from the 180-grit file Remove the dust and oils from the nail with a fresh Light Elegance Cleansing Wipe and Cleanser. Apply a thin coat of 1-Step or Finisher to the surface of the enhancement. Cap the free edge of the nail with the 1-Step or Finisher and cure Cleanse with Light Elegance Cleanser and a fresh Light Elegance Wipe. If you see anything that you would like to correct, use your Perfect File to remove the shine, reshape and cleanse the nail, then perform the rest of step four again.